Smart Seed is an application that involves real-time updates for keeping track of a plant’s well-being. The app is connected to a sensor that gets placed in the soil of the user’s plant, sending live updates on the soil moisture levels, humidity, and temperature of the environment, alleviating work on the user’s end. Elements of the design are structured in a way that reflects the organization and fun that goes into maintaining indoor plants. My main goal is to provide Smart Seed users with an efficient & organized way to take care of indoor plants. Improve: There are so many kinds of plants and people usually are unsure of how to take care of them the best way possible. I’m aiming to improve the treatment of plants and help users keep them alive through an app that provides mentorship. Through this app, my hope would be that users would have happier and healthier plants around their space. It also helps the user feel more involved in the process of taking care of the plants. Conclusions: The research has helped me understand the basic day-to-day routine of people who own plants. Most of these users are busy young professionals who just need something to help motivate them to take care of plants and to remind them that plant health exists. Problems/Needs: After asking the basic questions on plant care-taking habits and conducting research on competitive products while having users test out my prototype, I was able to identify the needs of users who own plants. The largest problem was that the users were too busy throughout the day and week to remember to water their plants. A need I found was that users wanted this process of taking care of their plants to be organized and fun. Solutions: Looking at the competitive products helped me find solutions for making my application more unique. To satisfy their problem for both organization and time, I have the home page as a quick overview of which plants need to be watered that day and the week of. For a fun interaction with the app, I have filters and social media sharing options for when they want to show off their plants. During the wireframe process, my main concern was to find out what main features needed to be represented by focusing on the user’s needs & motivations. Elements of the design are organized in a way that reflects the structure and fun that goes into maintaining indoor plants. The goal of this app was to give the user ways to learn more about their plants, methods of taking care of plants, and then notifications to water or change the soil of plants. The wireframe starts with an introduction and welcome screen that will lead the user to either choose logging in or creating an account and profile. Once the user logs in or has a profile created, they’re able to view the four main pages and features in the app - watering, discover, my plants, and my profile. 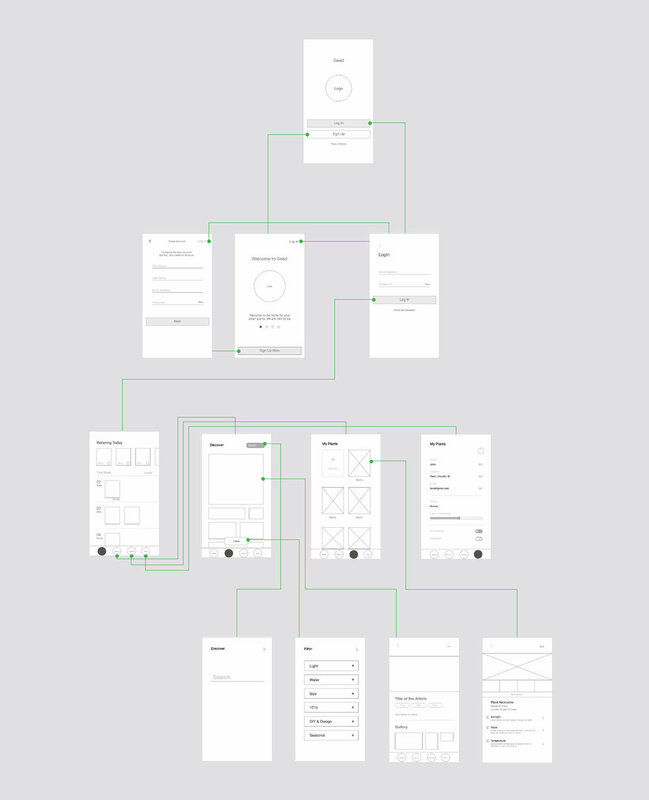 The wireframe shows my concepts for each main page. The images helps the user see which plants they own and how articles relate to a certain topic. On the bottom of each main page has the navigation bar to provide easy access to whichever page the user wants to navigate to. To help guide the user, the introduction and on-boarding screens provide instructions on how to connect the sensor with the app. Following this, the user is able to create their own account or sign in to an existing profile. The user flow is supposed to be intuitive and the tone is friendly. The design provides a rather simple navigation system and allows the user to move from one page to the next easily. The navigation bar is in a fixed position when scrolling on the screens so that it is both accessible and easy to find. Using effortless swiping and clicking gestures, the user will be able to comfortably sift through the app, no matter which screen the user is on.